More young Muslims in Calgary are picking up brushes, pens, cameras and microphones, and creating their own arts scene. A new generation is expressing themselves while honouring their religion in many different ways, including everything from traditional Islamic patterns and geometric art to performance poetry, writing and video installations. While some of the art reflects beliefs, culture and traditions, other forms offer a much more modern take on Muslim life in Canada. Islam and art have been connected for many centuries with a strong history of calligraphy, interlacing patterns, textile work, ceramics and glass work. Now a new generation is adding edgy video art, photography and spoken word poetry to that mix. "Islam is rich in art but sometimes people don't associate Islam with art," said Uma Samari at the latest Muslim Art Movement event at Calgary's Festival Hall in Inglewood. The events are organized by the Western Muslim Inititative. "My artistry is as much a part of me as my religion, the blend of art and religion is very natural," said Samari, a poet and author. Samari says more Muslim-focused events and exhibits in Calgary are crucial when it comes to giving new artists a platform. Her first performance was at one of the Muslim Art Movement events five years ago. "It changed my life, my relationship with myself and my relationship with other people," she said. "It helps to have events available to them. We have younger siblings and cousins and word of mouth helps a lot but more exposure of events will have people know that there's a space for them," said Samari. 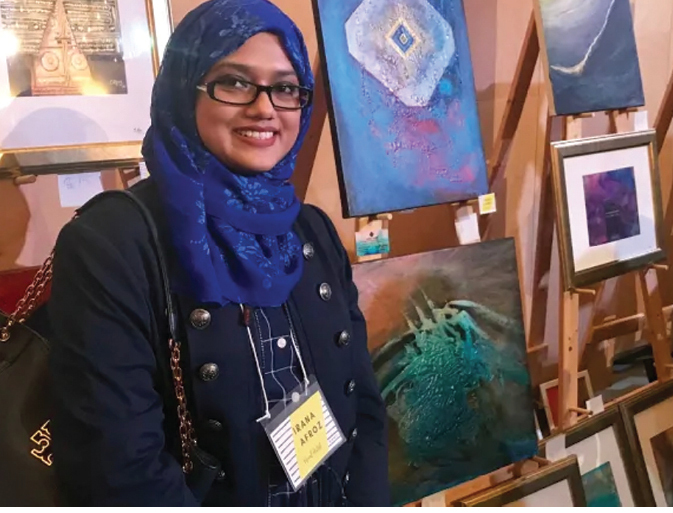 Many young Muslim artists are challenging stereotypes and realizing their dreams of a career in the arts, which often breaks with family traditions and expectations. "Growing up I never saw it as a possibility as a career," said Nada Khatib, who has been painting for 10 years. "I come from an Arab background and growing up it's your typical lawyer, doctor, engineer and people might make comments that are belittling or not something real but the proof is in the pudding," said Khatib. "I love to reach out to younger people and let them know this is something you can do. The arts are so important," she said. Khatib says the experience of being first-generation Canadian includes an adjustment for parents, who she says are slowly becoming more understanding and open when it comes to respecting their children's experience. "It might be different from their passions and it might be different from what they wanted but to have true freedom and independent success you need to be able to do what you feel you're meant to do," said Khatib, who adds it's still a struggle at times, both for her and others. It's largely a younger generation driving the Muslim arts scene in Calgary. Most of the artists mingling and networking at their latest event are in their twenties. "A lot of us are just graduating from university and wanted a platform and we couldn't find that platform out there so we had to create it and I hope we'll always have it," said photographer Safa Abida. "Maybe one day my future kids will be here presenting their art and expressing themselves," said Abida. Abida says by holding more events and opening them to the public there will be greater collaboration and relationships forming between Muslim artists and other artists and art organizations in Calgary. "Opportunities are few and far for artists regardless of background, " said Ahmed Latif, a writer and editor-in-chief of a magazine. "The Muslim voice and identity is only starting to come out now and I think we need to nurture that and have more safe spaces for them to hone their art," said Latif. "We we always need more space for art and more engagement between audiences and artists but what we need most is opportunities for people with little experience because their voices are still valid and their talent needs to be hones through experience more than anything else," Latif said. The next Western Muslim Initiative art event is a Make & Mingle paint night on Nov. 29 focused on watercolour painting.